From the 2004 Athens Olympics until the 2012 London Olympics, results from the Olympics was counted towards both the ATP and WTA world rankings in singles for that calendar year; no points were awarded for the 2016 Rio Olympics. While the ranking points distribution did not equate to those given at the Grand Slam tournaments, the Olympic tournaments have increased in perceived importance since their reintroduction, with some players, critics and sports pundits considering winning the gold at the Olympics just as prestigious as winning a Grand Slam title. A player who wins an Olympic gold medal and all four Grand Slam events in the same year is said to have won a Golden Slam. As of 2016, Steffi Graf is the only player to have completed this achievement. The playing surface of the court varies between Olympic Games. It has been on hard court for every game since 1984 except for the 1992 Olympics (which was on a clay court) and the 2012 Olympics (which was played on a grass court). The changing playing surface gives certain players different advantages and disadvantages not seen in most other Olympic sports. Italics represents that tennis was an exhibition or demonstration tournament at that Olympics. ^ Soltis, Greg (July 27, 2012). "Olympic Events Through History". LiveScience. Retrieved 2012-08-01. ^ Williams, Wythe (July 27, 1928). "SOCCER AND TENNIS BARRED IN OLYMPICS". The New York Times. Retrieved 2012-08-01. ^ "Olympic Tennis Event – History: Overview". International Tennis Federation. Retrieved 2012-08-01. ^ "2 More Olympic Games". The New York Times. October 2, 1981. Retrieved 2012-08-01. 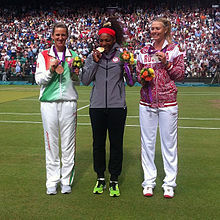 ^ "Olympics or Slams – What's More Important For Tennis Players?". Let, Second Serve. July 12, 2012. Retrieved April 5, 2015. ^ Paul Fein (September 20, 2012). "How Important Is an Olympic Gold Medal in Tennis?". World Tennis Magazine. Retrieved October 29, 2013. ^ Tignor, Steve (30 July 2015). "1988: Steffi Graf wins the Golden Slam". Tennis.com. Retrieved 17 September 2017.